It was on March 13, 2013, that most people heard of the Argentinian Jesuit Jorge Mario Bergoglio for the very first time. He was presented to the world as "Pope Francis". Presumably, most who witnessed the first appearance on the balcony of St. Peter's Basilica will never forget the unusual experience: There he was, the first papal claimant to take the name "Francis", clad entirely in white, without the customary red stole for the urbi et orbi blessing, looking at a jubilant crowd. His initial words of buona sera -- "good evening" -- and his subsequent request for the people gathered in St. Peter's Square to pray over him before he would "bless" them, were an ominous harbinger of what was to come. From the very beginning, we have chronicled the major scandals, errors, heresies, gaffes, blasphemies, and other outrages committed by "Pope" Francis. To catalogue them all would be a virtually impossible task, as the Bergoglian jaw has been moving nonstop since that fateful evening. 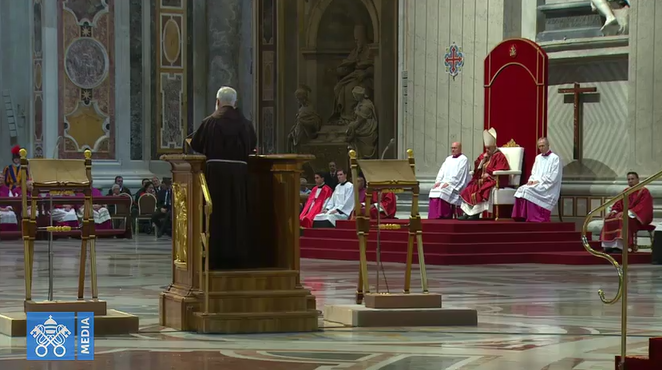 Our coverage of the 2013 conclave, by the way, is still accessible here. On April 3, 2013 -- a mere 21 days after his election, while people like Michael Voris were busy trying to tell you what a wonderfully "conservative Pope" the world had been blessed with -- we predicted on Twitter that Francis would eventually be known as the "Chaos Pope" (see original tweet here). We were denounced by all sorts of people then, but guess what: We were right. For the big four-year anniversary a month ago, lots of Novus Ordo, semi-traditionalist, and secular web sites, of course, had something to say about these past 1,461 days of Francis. We present to you a number of them in the list of links below, without commentary. Now that people both inside and outside the Novus Ordo Sect are talking about the possibility of an intra-NovusOrdo schism due to the chaos created and maintained by Francis, it is perhaps more interesting than ever to see how the various factions within the Modernist establishment assess the state of things at this time. For those who are interested in a genuine and hard-hitting traditional Catholic critique of Francis' false pontificate, we highly recommend the popular podcast program "Francis Watch", produced by our friends at True Restoration (the more recent episodes require a paid subscription but a good number of the earlier episodes are entirely free). Each episode of Francis Watch is typically between 1-2 hours long and features Bp. Donald Sanborn and Fr. Anthony Cekada, both of whom dismantle the Bergoglian sophisms in light of the doctrines and principles of the Catholic Faith of the ages. It was on March 13, 2013, that most people heard of the Argentinian Jesuit Jorge Mario Bergoglio for the very first time. He was presented to the world as “Pope Francis”. Presumably, most who witnessed the first appearance on the balcony of St. Peter’s Basilica will never forget the unusual experience: There he was, the first papal claimant to take the name “Francis”, clad entirely in white, without the customary red stole for the urbi et orbi blessing, looking at a jubilant crowd. His initial words of buona sera — “good evening” — and his subsequent request for the people gathered in St.